I’ve never used a faster document converter than VeryPDF PCL Converter before. I always use VeryPDF PCL Converter to convert documents and set options like convert PRN to PXL and fit to paper size. Hence, in this article, I would like to introduce how to use VeryPDF PCL Converter to solve your problems. Only four steps are required. But before start, you need to download VeryPDF PCL Converter and install it on your computer. Then, let’s see how to convert PRN to PXL and fit to paper size so easily. Firstly, please double click the icon of VeryPDF PCL Converter on the desktop, and then you will find the interface of VeryPDF PCL Converter on the desktop. Secondly, please drag the PRN files from Windows Explorer, and then drop them to the list box on the main interface. You can view the files names and paths of the selected PRN files through the list box. If you want to remove some added PRN files, you can select them first and then press Delete on the keyboard. Thirdly, you should click Setting under the list box to open a dialog box. Then, specify .pxl as the target format in the Output format combo box. After that, select a paper size like c4 in the Page Size combo box. You can also set other image output options such as color depth. It depends on your priority. Just click the second tab to switch to the Save Image Mode tab control and selected related options there. After setting all the options, don’t forget to click OK at the bottom of the dialog box. Fourthly, please click Start on the main interface. In the dialog box that pops out, please select a folder where you are going to store the result PXL files in, and then click OK to start the conversion. These are the four steps I take to convert PRN to PXL and fit to paper size. 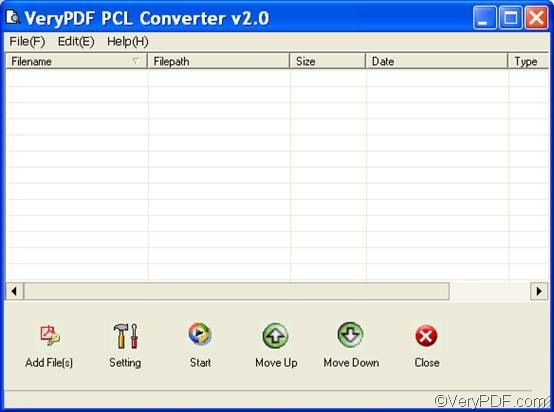 \ VeryPDF PCL Converter can also help you convert other types of files quickly and accurately. Please try it. This entry was posted in VeryPDF Blog and tagged fit to paper size, prn to pxl. Bookmark the permalink.